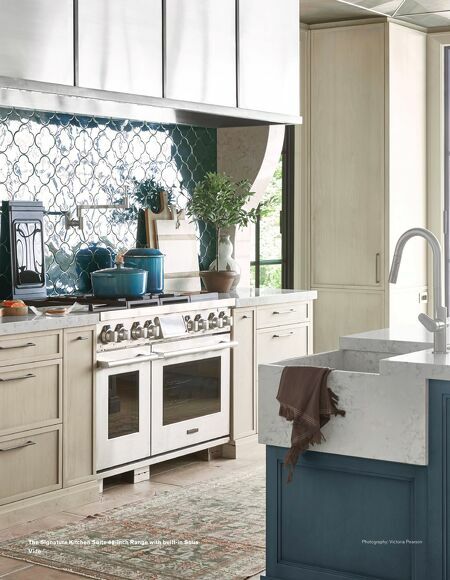 FEBRUARY 2019 RETAILOBSERVER.COM 9 Encore Performance NEW SIGNATURE KITCHEN SUITE APPLIANCE LINE EMBARKS ON ITS SOPHOMORE YEAR WITH EXCITING NEW PRODUCTS AND THE INDUSTRY'S BEST DESIGN CENTER FOR DEALERS AND RETAILERS W hile it's true you never get a second chance to make a first impression, a new luxury appliance brand is poised to make its high-profile encore just 12 months after wowing dealers, retailers and the industry with its splashy launch at KBIS 2018. 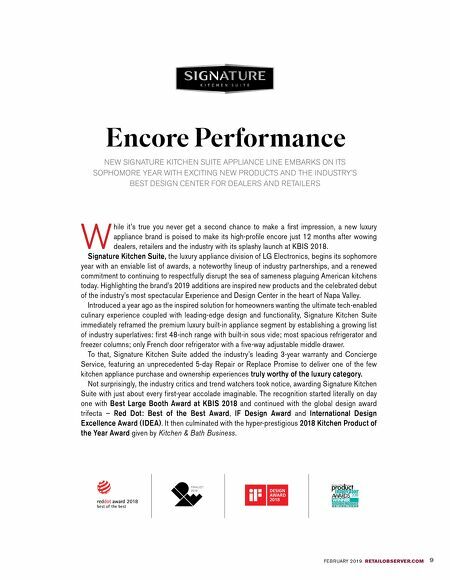 Signature Kitchen Suite, the luxury appliance division of LG Electronics, begins its sophomore year with an enviable list of awards, a noteworthy lineup of industry partnerships, and a renewed commitment to continuing to respectfully disrupt the sea of sameness plaguing American kitchens today. Highlighting the brand's 2019 additions are inspired new products and the celebrated debut of the industry's most spectacular Experience and Design Center in the heart of Napa Valley. Introduced a year ago as the inspired solution for homeowners wanting the ultimate tech-enabled culinary experience coupled with leading-edge design and functionality, Signature Kitchen Suite immediately reframed the premium luxury built-in appliance segment by establishing a growing list of industry superlatives: first 48-inch range with built-in sous vide; most spacious refrigerator and freezer columns; only French door refrigerator with a five-way adjustable middle drawer. To that, Signature Kitchen Suite added the industry's leading 3-year warranty and Concierge Service, featuring an unprecedented 5-day Repair or Replace Promise to deliver one of the few kitchen appliance purchase and ownership experiences truly worthy of the luxury category. Not surprisingly, the industry critics and trend watchers took notice, awarding Signature Kitchen Suite with just about every first-year accolade imaginable. The recognition started literally on day one with Best Large Booth Award at KBIS 2018 and continued with the global design award trifecta — Red Dot: Best of the Best Award, IF Design Award and International Design Excellence Award (IDEA). It then culminated with the hyper-prestigious 2018 Kitchen Product of the Year Award given by Kitchen & Bath Business.